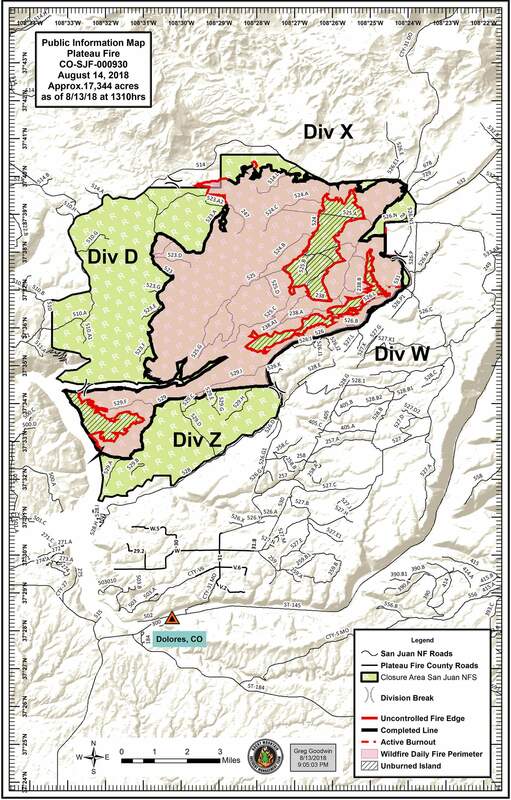 The Plateau Fire’s containment lines (black), uncontrolled fire edges (red), interior burns (hashed green) and closure ares (green). The Plateau Fire north of Dolores has grown about 1,000 acres since Sunday as firefighters focused on closing an uncontrolled line in the fire’s northwest corner. According to a map provided by Team Black, a gap in its containment line still remains in the northwest corner just south of Forest Service Road 514, known as The Glade Road. Pockets of unburned land within the containment line continue to burn in the northeast area east of the Dolores-Norwood Road and in the southwest corner at McPhee Reservoir’s shore at Beaver Creek. On Tuesday, the fire reached 17,344 acres. 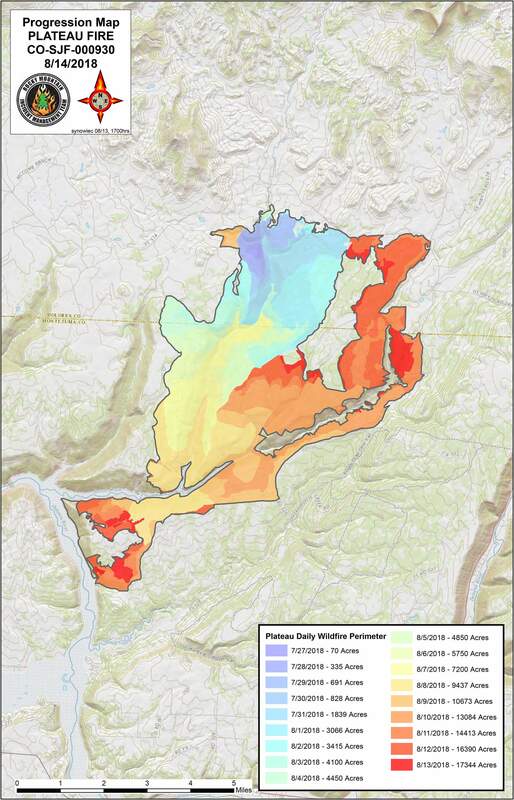 Containment reached 95 percent, up from 93 percent on Sunday, and full containment was expected Aug. 30. The cost of the fire so far is $3 million. The Type 2 Rocky Mountain Incident Management Team Black also announced Tuesday that it would return management of the fire to a local team at 8 p.m. Crews will be downsized significantly this week and assigned to other wildfires in the West. On Monday, 177 firefighters were working on the fire. The Dolores-Norwood Road (FSR 526), House Creek Road (FSR 528), Dry Creek Road (FSR 510) and the Boggy Draw trails east of Dolores-Norwood Road reopened on Sunday, and Team Black advised drivers to use caution near the fire area because firefighters are still in the area. San Juan National Forest land remains closed west of the Dolores-Norwood Road to The Glade Road (FRS 514) on the north, House Creek Road (FSR 528) on the south and McPhee and Dry Creek Road (FSR 510) on the west. Smoke continues to come off the Plateau Fire, and along with smoke from other regional fires, and affect residents in Montezuma and Dolores counties. On Tuesday, the Colorado Department of Health and Environment issued an air quality advisory for much of the Western Slope effective until 9 a.m. Wednesday. The federal Black Team, which arrived Thursday, gave residents a brief summary of its efforts during a public meeting Sunday at the Dolores Community Center. Containment does not mean the fire is out, Daniels said, and about 1,500 acres of unburned forest within the fire’s containment perimeter will continue to burn. Smoke will continue to settle in the West Fork and Dolores river valleys. “Containment means it will not spread,” Daniels said. The progression of the Plateau Fire, Aug. 14.